GP Charlotte confirmed something I’ve felt about Modern all year: if you’re not casting Tarmogoyf, and you’re not casting Blood Moon, you’re losing. Obviously the rule has exceptions; many linear decks hope to “get under” Goyf and Moon decks by attacking from angles Modern’s interactive top dogs haven’t prepared for. But at the end of the day, interactive decks beat the linear decks they care about. Collected Company won GP Charlotte, but Pyroclasm and Anger of the Gods should check it in the future. Lantern Control and Griselbrand Reanimator also enjoyed some top-table spotlights, but these decks lose with a target on their heads. Linear decks continue to exist in Modern because, without the card velocity and consistency of Legacy staples like Ponder and Preordain, 15 cards isn’t enough to prepare for every all-in strategy. You can’t always dodge the deck you don’t want to face. I led with a pretty bold claim, so I’ll take some time to elaborate. Tarmogoyf is dramatically better than every other creature in the format. Most of the removal he doesn’t dodge costs more than he does. Even Abrupt Decay and Terminate, which match him in converted mana cost, force opponents into multiple colors and subsequently soften them to Blood Moon. Path to Exile, the cheapest answer to a Goyf, turns the creature into card advantage. And countering one-half of a Bolt-Bolt response wins games on its own. Blood Moon is a card people fear. They know about it, they fetch around it, and they still lose to it. You can leave Moon in the sideboard and still expect it to win you games as Grixis Twin opponents cut themselves off double red to keep from losing to the enchantment. How many cards in Modern win you games from the sideboard? Moon’s biggest strengths are its splashability and reliability – it fits into everything (Bolt pushes interactive decks into red anyway) and hoses just about every rogue deck in the format. Moon invalidates more strategies than any other card in Modern, forcing deckbuilders to construct efficient, straightforward manabases or to lose half their matches on turn 3. Back to consistency, one of the game’s most powerful mechanics. Can you guess Modern’s third play-it-or-die card? Serum Visions give players a huge edge over the nonblue competition. For a tiny investment, it influences whether ensuing draws provide win conditions, interaction, combo pieces, or mana. It’s a one-mana Abundance, and why even draw-go decks like UWR Control don’t run it continues to bewilder me. Monkey Grow was an easy choice for Charlotte. I’m very comfortable with the lines, which often surprise opponents inexperienced against the deck (read: all of them), and it plays Serum Visions, Tarmogoyf, and Blood Moon. Disrupting Shoal positions Grow better than any other deck against a field of diverse linear strategies, and I can practically “go linear” myself with explosive openings like Delver into Mandrills into Stubborn Denial. I’ve tweaked the deck a little since the SCG IQ. Recent testing showed me the absurd relevance of Simic Charm, and I now consider a full set part of the deck’s core – my tournament report speaks for the card’s strength in this deck. That leaves a single flex spot. I packed Tarfire over Curiosity as my Goyf-booster of choice, expecting a decent amount of Grixis creature decks (against which it hits Pestermite, Young Pyromancer, Delver of Secrets) and Collected Company (against which it hits everything). My testing against Jund with mainboard Curiosity proved favorable enough that I figured cutting the enchantment to beat up on mana dorks wouldn’t hurt the matchup much. By UW Midrange I mean Kitchen Finks, Restoration Angel, and Celestial Colonnade. My opponent apparently worked with Jeff Hoogland on the list. Game 1, I keep a hand of 2 Bolts, Tarfire, Scour, and lands, and draw a third Bolt. My opponent’s turn 1 Colonnade lets me know this hand might not get me there. Neither of us do anything until I draw a Delver some turns later. Path to Exile targets him on my upkeep but I hardcast a Shoal for 1, then draw a Hooting Mandrills, attack a couple times, and burn my opponent out with Bolts. All he drew was a Kitchen Finks. Game 2, I resolve turn 3 Blood Moon after my opponent taps out for Finks, taking him off white. He eventually draws a second Island and transmutes Tolaria West for Plains, allowing him to flash in a Restoration Angel. But by then my Huntmaster’s flipped three times too many. I Shoal a turn 1 Noble Hierarch and resolve Delver into Goyf. Goyf gets chumped by a Spellskite and then by an Inkmoth Nexus, but Simic Charm +3/+3s my Delver for lethal damage. Game 2, my end step Lightning Bolt targeting a tiny Inkmoth gets Dispelled, and next turn my opponent puts a Might of Old Krosa on the Nexus before attacking. I Ancient Grudge it before damage. A pair of Goyfs get there pretty handily. End step Charm bounces one Glistener Elf and the second blocks a Tarmogoyf; another Simic Charm pumps the unblocked Goyf for lethal. I mulligan twice game 1 and fetch a Breeding Pool, knowing I’ll be stuck on one land. I have Thought Scour and Mandrills and am able to power the monkey through on turn 3. He eats a pair of Electrolyzes, but I resolve another Mandrills. I start attacking and casting end step Lightning Bolts, getting off three of them for lethal before my opponent draws Scapeshift. Game 2, I find my lands, but not my threats. Scapeshift kills me. Game 3, my opponent mulligans to 5 and I cast turn 2 Mandrills and turn 3 Delver. Probe shows me Cryptic Command so I cut myself off green with an early Blood Moon. Mandrills kills my opponent before he can draw the third blue source. Game 1, I have Delver into double Goyf and only a Disrupting Shoal to slow my opponent down. But I’m fast enough to get there before he draws anything. Game 2, I mulligan two no-landers and Probe shows me triple Summer Bloom, Titan, and Thragtusk. All I have is Island and Delver, so this one ends quickly. Game 3, I tap out for turn 2 Tarmogoyf, knowing I need a threat and hoping my opponent doesn’t have a Summer Bloom. He does, and with a Cavern naming Giant. I figure he has the Titan and know I’m dead to it next turn. But miraculously, I draw Blood Moon off the top. Delver and Simic Charm close out the game. I lead with double Delver and my opponent’s stuck on 3 lands. He has a bunch of clunky Lingering Souls. On the last turn, I bolt a Spirit and Simic Charm pump my unblocked Delver for lethal. Game 2’s a grindfest; all my stuff gets killed and Creeping Tar Pit brings me all the way down to 8. My opponent has no nonbasics in play and tapped his Polluted Delta with an Urborg, Tomb of Yawgmoth to animate the Tar Pit, so a Blood Moon locks him out. He finds an Island but dies to Huntmaster. Game 1, we both mulligan once. My best play of the day: I land a 2/3 Tarmogoyf (Probe and land) and he drops a Tasigur with 3 mana up. I draw Simic Charm and attack with Tarmogoyf. He flashes in Pestermite to tap down my Steam Vents, and I float blue in response. Then he double blocks the Goyf. I use the blue and tap Forest for green to cast Simic Charm, bringing Goyf to 6/7 – just big enough to kill Mite and Tasigur while surviving. I cast Mandrills and take the game. Game 2, I Tarfire + Lightning Bolt a Tasigur so my two Mandrills can do some work. I fetch and Probe like an idiot and end up at 3 life, but my opponent never finds Lightning Bolt and the monkeys kill him. Nam Sung-Wook is quick to double Bolt my Hooting Mandrills. I’m short one mana to Stubborn Denial the second burn spell, and my follow-up Tarmogoyf is no match for Scavenging Ooze, Dark Confidant, and Liliana of the Veil. Game 2, I transform a pair of Delvers after the third gets Bolted. Ooze has no targets after I delve out my graveyard for Mandrills, and I sacrifice the monkeys to Liliana for the lethal aerial swing off a Simic Charm pump. Game 3, I keep a sweet hand with three threats. I slow-roll my Delver, casting a turn 2 Mandrills to dodge a represented burn spell, but the Ape again eats two Bolts. I follow-up with double Delver, and one immediately dies to Chandra, Pyromancer. I transform, attack the Chandra, and kill it with Bolt. Nam tries to Decay the Aberration next turn, but I protect it with Simic Charm; it still dies to a Liliana. Then I get my Huntmaster Thoughtseized and a Tarmogoyf runs me over. I lose my Delver and Goyf meets another Goyf. I don’t have the Simic Charm to push through and my opponent draws Liliana to stabilize. Game 2 goes pretty much the same way. A third straight beating from Jund. Two removal spells and my own two Thought Scours put all my Tarmogoyfs in the graveyard. Mandrills gets close, bringing my opponent to 6, but I have to Leak a Huntmaster, which puts a creature in the yard for Scooze. I’ve got no choice but to force Scooze and Confidant to double block the monkeys, killing them both, because otherwise Ooze grows to 4/4 next turn. Tarmogoyf from the top forces my scoop. Game 2 I run into a Thragtusk, which I kill. My opponent returns it to his hand with Kolaghan’s Command. I seize the opportunity to Blood Moon, cutting him off green, but he draws a Forest naturally before my Delver can kill him. Scavenging Ooze follows the Value Beast and I can’t keep up. I mulligan to 5 and my opponent goes to 4. I open with Serum Visions, Tarmogoyf, and Tarfire my opponent to turn on Stubborn Denial and start clocking for four each turn. He makes his land drops and continuously chumps Tarmogoyf while I slow-roll a Bolt with my opponent at 4. I eventually cast it his end step, and he cracks Mire in response to cast Cryptic Command into my Stubborn Denial. Game 2, I mulligan once and draw a lot of nothing. Tasigur beats kill me. Game 3, my opponent mulligans once and is stuck on two lands. Goyf into Mandrills with Denial backup kills him. Game 1, I mulligan once and assemble an army of Goyfs and Mandrills. My opponent stalls just long enough to find Splinter Twin for the Exarch with Desolate Lighthouse at 6 life. Game 2, my turn 2 Mandrills goes unanswered. Probe gets Negated, and I Simic Charm pump with my opponent at 10. He goes to 3 and tries to Dispel my Lightning Bolt, but I respond with Stubborn Denial. Game 3, I mulligan once and am stuck on two lands with a hand of Bolt, Simic Charm, Destructive Revelry, Stubborn Denial, Serum Visions. I have Goyf and Mandrills in play when he goes off, and I try to Deny the Splinter Twin to play around Spell Snare since my opponent’s at just 4 life (no sense in maybe blowing him out with Charm). He taps out for Dispel and I’m short the third land to cast Revelry or Charm. Probe shows me double Signal Pest and an Arcbound Ravager. I Shoal the Ravager but the Pests, backed up by a Welding Jar, prove too much for my two flipped Delvers. A second Ravager puts a counter on Pest so it kills Aberration after blocks. Game 2, Tarfire into Shoal slows my opponent way down. A 6/7 Tarmogoyf puts him on a two-turn clock. He gets Cranial Plating on a Spellskite and attacks me, but I bounce the Skite with Simic Charm and Revelry the Plating. I bounce the Skite again next turn and attack for lethal. Game 3, I’m too slow to burn a Vault Skirge with Tarfire. I was waiting on a Huntmaster to eat the Skirge and taking 1 Lifelink and 1 Infect damage per turn. Couldn’t find a single threat of my own to establish an actual clock and Champion + Galvanic Blast killed me. We’re dueling for cash at this point. My opponent leads with Island, go, and I correctly peg him for Merfolk. I play a Tarn and pass, Bolting his Lord of Atlantis and following that up with a Tarmogoyf. But 3 copies of Spreading Seas cut me off green and red and the Goyf gets Vapor Snagged. Game 2, I Revelry an Aether Vial then slowroll Pyroclasm to hit Cursecatcher, Silvergill Adept, and Kira, Great Glass Spinner. Eventaully my 5/6 Tarmogoyf is racing a bunch of unblockable Folk. At 7 life, my opponent gets me to 1, and on the end step I Simic Charm bounce his untapped guy. Then I untap, attack, and Charm pump for lethal damage. Game 3, I Shoal a turn 1 Vial. My opponent casts Cursecatcher next turn and misses his second land drop. He finds the Island next turn and plays Master of the Pearl Trident to match my Tarmogoyf, but I Bolt the Master and attack for 4. My two Delvers never flip but my Huntmaster does and I drown the fish in value. Game 1, we both mulligan and I lead with Probe, Delver. I see Dryad Arbor, Rancor, Daybreak Coronet, Spirit Link, Spirit Mantle, and Temple Garden, and correctly figure he’s on an equip-the-tree plan. He lays Arbor and passes, and I play another Delver and attack on the ground for 1. My opponent tries to put Rancor on the Arbor with Garden, but I Bolt it in response. The Delvers flip and are joined by a Mandrills, attacking for lethal the turn after. Game 2, I Shoal Spirit Mantle with a 2/3 Tarmogoyf out, growing him to 4/5. My opponent has Gladecover Scout with Ethereal Armor and Hyena Umbra, and asks how big my Goyf is. I say “4” and he attacks with the Scout. I block and he says, “First strike?” I say sure and then eat the Umbra. Guess he didn’t know Goyf had +1 toughness. I scry Stubborn Denial to the top and draw it with Gitaxian Probe for life, leaving mana up instead of casting Mandrills and Delver in case my opponent draws a Coronet. He does, and I Deny it before casting my creatures and swinging for lethal. Getting Terminated by other green decks taught me an important lesson: as long as BGx patrols Modern, Curiosity will shine in this shell. No other deck can abuse the card like Monkey Grow. Turn 1 Delver, turn 2 Curiosity with Denial or Disrupting Shoal for protection wraps games up immediately against most of the field. Meanwhile, the card is integral to victories against resilient attrition decks. My threats would often connect against Jund 2-5 times before opponents found and resolved an answer. At that point, they’d sit comfortably at 5 life and kill me with Goyfs as I drew into lands and counterspells. Curiosity makes those 2-5 connections draw me that many cards, ensuring I have more protection for my creatures, extra threats to keep the beats flowing, and reach to end the game. It invalidates the BGx strategy of one-for-oneing its adversaries and is just as relevant against Jund as it was against Abzan. But with 4 Simic Charms, space is scarce. I’m cutting a Thought Scour and the Tarfire for 2 Curiosity. With double Pyroclasm in the board, Tarfire might be overkill against Company decks. Scour helps set up Mandrills-Denial on turn 2, but it’s still weaker than Charm, and probably than anything else in the deck. On other alterations to the core, I can also see cutting one Disrupting Shoal for the fourth Denial in some metas. Modern might not be “wide-open,” but it’s definitely varied enough to remain my format of choice. I look forward to seeing this and other archetypes evolve in the coming months. Thanks for the write-up! Tons of useful info here. Correct me if I’m wrong, but in your round 7 description, I’m not sure that that’s a legal play. To use the Pestermite as a blocker, he would need to flash it in during the declare attackers step. This means when you float blue, it would empty from your mana pool when you change steps to declare blockers. Thus, you wouldn’t have the blue floating to cast the Simic Charm. Great article, though. I’m glad to see even more variety in Modern. Oops, seems like we were using pre-M10 rules. That’s embarrassing. 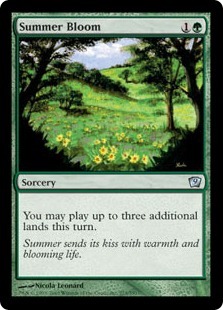 I did have an extra land that turn, but thanks for the rules tip! Blood Moon was also strangely absent from most of Twin’s feature matches (I do not doubt they had it, but they didn’t really draw it which suggests that they weren’t running many copies) I expected to see Blood Moon every where with all the hype, yet it seems to have been exaggerated as much as Bloom and Tron were. GR Tron is the only deck that doesn’t exactly fit into any of these categories, falling somewhere between linear and interactive. I’ve put it with “linear decks” since it mostly attacks other midrange strategies in a very linear way, running expensive blanket answers that deal with anything (Oblivion Stone and Karn, Silver Golem). Like other linear decks, it’s easy to disrupt and follows a single trajectory to victory (assemble Tron while slowing down opponents via effects like Pyroclasm, cast whatever fatty you have in hand, win). In the Top 8, we had two interactive decks (both URx), five linear decks (all of different flavors), and a single fair aggro deck. I accounted for each of these in my article, though I do consider fair aggro weaker than interactive (URx/BGx) and linear decks (the Top 8 supports this assessment). Collected Company obviously gives these decks a huge boost, more than pushing them into the realm of playable, but Modern’s history tells us that URx and BGx have and will use the tools necessary to beat these decks. Anger of the Gods, Dispel, and Grafdigger’s Cage all come to mind as splashable, effective answers. Nice article. Your sideboard changes look great; Feed the Clan and Pyroclasm are very solid additions. Did you put any thought into running Anger of the Gods over Pyroclasm to deal with Kitchen Finks and other persist creatures, or do you just not think it’s worth the extra mana? Not worth it. This deck is not designed to get to RR. I just recently topped 8’ed at my local IQ with about 50 people, going 5-1-1. My build was very similar to yours but I had 18 lands and 1 dismember and 2 mimic charms in the main. I currently have 2 firespouts in the board and kept 2 snapcasters in the main deck as well. What are your thoughts about firespout vs. pyroclasm? Snapcaster seems to have so much mid-game value, did you find it too clunky, or was he cut to make room for clasm? Depends how many x/3 creatures you want to kill. I can’t think of any, so Pyroclasm’s fine. A one-mana difference matters a lot in this deck (as evidenced by how good Stubborn Denial is). If you haven’t tried more Simic Charm, give it a go; I’d call it the best card in the deck. Not really into mid-game value Game 1, so I’d rather have tempo plays like Simic Charm than Snapcaster Mage. Not having to worry about leaving specific cards in the graveyard is nice, too. Game 2, Huntmaster just does a better job at generating value than Tiago. Thanks for the advice; as a side note, I chose firespout mainly for the option to kill non flyers because of the delvers. The 3 damage of spout I see advantageous mainly against merfolk and collected decks but the 3cmc came up in a few games. I will try running your version because I think your assessment is spot on about being a strict tempo deck game 1, and the issue of value is properly addressed post-board as you said. I do agree simic charm is in a good place right now for the meta. How come this site is completely ignoring GP Copenhagen? I am sure that there will be articles on it this week. They are analyzing what happened at the events after they happened. We could have done a pre-GP Copenhagen article with predictions, but it was a little too close to the previous GP to be too interesting. Also, with GP Charlotte wrapping up last week, we felt it more important to do retrospective and reflective articles on that huge event than just do predictions for the next one. Next week will have a number of GP Copenhagen articles though! 12 Aether Vials and 0 Collected Company in the top 8! The only ‘bad’ thing to come out of GP Copenhagen was Twin’s 15% Day 2 share – which is ban talk level. The Ghost Way decklist is on the coverage page along with lots of other decks that were outside the Top 16. Hey Jordan, I was your R6 opponent on Esper Mentor. I made a pretty big punt that game casting a lingering souls from hand rather than from grave. That opened it up to a stubborn denial. It was good playing with you. I ran a similar list to yours this week at the local shops and enjoyed it. I found I wanted the moon main deck and Simi Charm is where it was at all night. Have you considered sultai delver? I lack the tarns/mistys so have been working with sultai and grixis builds (you can live without one fetch type but not both). In a nutshell you lose bolt, gain abrupt decay and tasigur. It plays a slower, more methodical (4 snapcaster) game than RUG since you don’t have bolt to burn people out and you can grind better with tasigur and snapcaster if it goes long. My assessment has been that mandrils, charms, curiosity and shoals all need to go together as a package. But I think once you’re on decay instead of bolt eeking quick points of damage off of charm pumps and mandrils trample loses some of its lustre as you’re less likely to just get there with lethal. I´m working on that one too. One addition to your list is Grisly Salvage and Rancor. Rancor pretty much is Curiousity and Bolt married together and can lead to blowouts like T2 flipped Delver with Rancor on top protected by Shoal, backupped by Denial. Further it breaks Tas/Goys deadlocks. Salvage is a nice possible one-off as it accelerates both Goyf, pays for Tas/Mandrills aswell as digs deep. I tried Mishra’s Bauble but it was too bad against attrition decks for me to want it (see my primer on the deck here: http://modernnexus.com/welcome-to-the-jungle-mandrills-in-modern/ for more info on Bauble). We don’t want “slow and methodical;” just play Grixis Control if that’s your style. This is a tempo deck. Decay is sweet, but Delver really wants the reach from Lightning Bolt. Adam Fronsee had some success with a BUG list utilizing my shell at Columbus (he placed 12th). But IMO Mandrills is better than Tasigur in tempo, especially with Bolt for extra damage. Bolt is also super relevant right now, as discussed above. Finally, looking ahead, as Day’s Undoing looms over the Modern format, I really wouldn’t want to run a deck without Lightning Bolt. Nice write-up. I’m surprised at how much you missed Curiosity, but upon seeing your write-up, it makes a lot of sense. Anything that keeps the hand stocked in this deck is excellent, and your “protect the queen” ethos means that even if you get 2-for-1’d later on, it probably got you 2-3 cards before that happened, so you won’t be shedding too many tears over it. Do you think it will be enough to at least bring your BGx matchup to respectability? If not, what sideboard pieces could help you on that front? I was thinking something like Relic of Progenitus or Tormod’s Crypt to selectively suppress their graveyards. Also, GP Copenhagen’s results disagree with your assertion of Merfolk being lower-tier. The deck may be linear, but underestimate it at your peril. Yes, Curiosity brings the Jund matchup favorable, at least according to my testing. And while it gives us some help in the Abzan matchup, we still can’t really win that one. with that exact 75 you played at the GP.